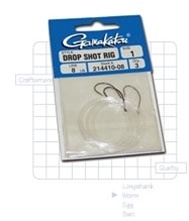 These leaders feature Gamakatsu’s Split/Drop shot hook attached to 6 feet of premium monofilament. The hook is attached in the center of the line leaving a 3 foot long tag to let the angler choose the level to suspend the bait. The 3 feet on the other end allows anglers who are deep vertical jigging with braided line some separation between their line and the bait. They come packaged 3 leaders per pack and in three sizes: A size 4 hook with 6lb line, a size 2 hook with 8lb. line and a size 1 hook with 8lb. line.